I've been so immersed in school-and-work-related reading lately that, now that I'm nearing the tail-end of my thesis process, I suddenly had a trigger-reaction about wanting fiction books. I've been reading fiction at night right along--a few pages every night before going to sleep. But it's been a l-o-n-g time since I've had a rainy weekend morning in an armchair with something fun to read. Rainy weekend mornings have been spent either at my computer or reading...well...other stuff. So, in a moment of late-night weakness recently, I did some research on book subscription services and chose PageHabit. I'd done Wordy Traveler for a couple of boxes and, although I enjoyed the first book, I only finished about half of it. The second book was equally big and daunting, and equally nonfiction. Don't get me wrong, I love good nonfiction and do often choose to read it recreationally. But at the moment, I'm a bit nonfictioned-out. I decided to cancel that subscription for the time being--I may go back to it at some point in the future because it is intriguing--and find something a little more fun and lighthearted. 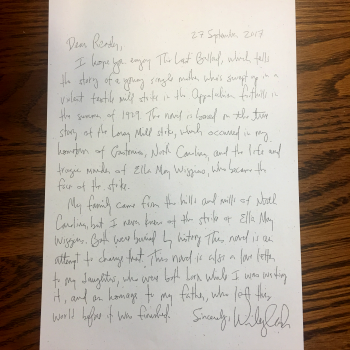 This month's book is Wiley Cash's The Last Ballad. As I read the book description, I thought, "This is exactly in my wheelhouse!" Although it's fictional, it's based on a real event and real people. From Amazon: "The New York Times bestselling author of the celebrated A Land More Kind Than Home and This Dark Road to Mercy returns with this eagerly awaited new novel, set in the Appalachian foothills of North Carolina in 1929 and inspired by actual events. The chronicle of an ordinary woman’s struggle for dignity and her rights in a textile mill, The Last Ballad is a moving tale of courage in the face of oppression and injustice." Okay--so it's still not all that far away from the nonfiction I read for work (women in the face of oppression and injustice), but still. The cool feature about PageHabit, though, is the author's annotations. The book comes with a letter of introduction from the author, explaining his inspiration and a little bit about his own connection to the story. Throughout the book there are sticky notes with the author's annotations, as well. Right off the bat, within the first few pages, I've read annotations about recurring themes or motifs to watch for through the rest of the book. As a former English Lit, major, that seriously jazzes me. I'm forcing myself not to flip ahead to read all the annotations first! 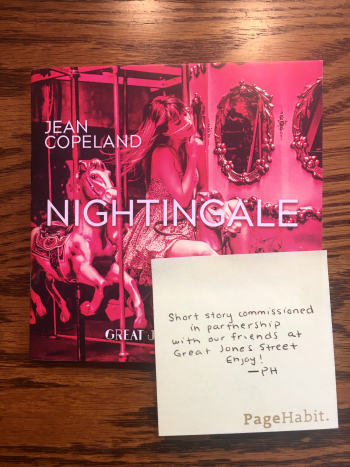 Some of the annotations are nice little personal connections, too, like a charming note about a song included in the story, and the author pointing out he sings that same song to his own young daughters at night. I've never heard of Wiley Cash before, which is exactly why I'm trying a book subscription service. Like most people, once I find an author I like I tend to read everything by that author (topic withstanding). Then, once I'm done, I feel at a bit of a loss until I can find the next author. My hope is that, by doing a book subscription, I'll be introduced to all sorts of cool new writers and my horizons will be expanded. I'm an avid user of GoodReads, of course, which does help--but it still tends to depend on what I actually search for, which again leaves it up to my somewhat "getting-in-a-rut" style of reading. There's also a short story commissioned for PageHabit. It doesn't give a whole lot of information about this one--no annotations, no explanation as to why this story was chosen. I’ve read this already and wasn’t really jazzed by it, but no biggie. The nice thing about short stories is that there's not a huge time requirement. As with most of these book subscription clubs, the book comes along with a few related gifts. As opposed to Wordy Traveler, in which the gifts were related (mostly) to a particular area of the world, in PageHabit--at least with this first shipment--these were just general bookish and holiday themed gifts. The box included a bookmark with a quotation from Albert Einstein. (See the picture of the book above. The bookmark is on top of it.) Since I'm a Kindle girl usually, I've long ago lost most of my bookmarks so it's handy to have one now that I'm reading the occasional physical book. Finally, this box included a fun pillowcase that I could see myself using on quilt retreats. It seems like it's made of a nice cotton. It's in the wash now so we'll see how soft it is once it comes out. For every shipment, PageHabit donates to a children's literacy project. Each month they partner with a different organization engaged in helping children read and/or having improved access to books. So--for my first shipment so far, I'm enjoying it. If you're interested in PageHabit, here's the usual referral link!